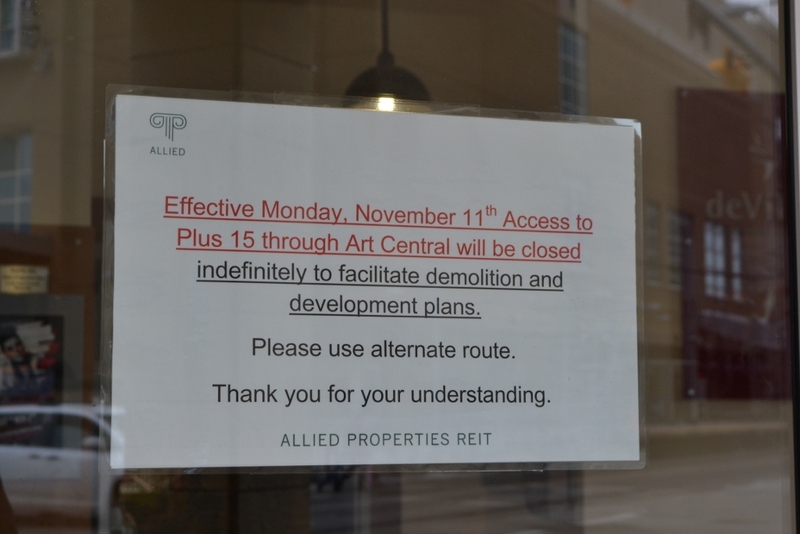 Last week I walked past Art Central. I noticed the signs on the door indicating that effective today, the +15 will be closed to all foot traffic between it and adjoining buildings. It is a bittersweet day for me – ironically falling on Remembrance Day. Like when a long-standing relationship draws to a close – one remembers both the good times and the bad. I used to have a space in Art Central. Truth be told, I had four or five of them over the years. Sometime around 2001-2003 the leasing agent for Art Central came to visit both the owner of the gallery I once worked at, along with myself. He was looking for established galleries to anchor the development. After his presentation and others I attended in that timeframe, along with discussions with other dealers who were located close by, it became clear that it the location was not suited for a gallery and probably why no pre-existing and established commercial galleries ever a space. Of course, there was Rob and myself but we both had pre-existing histories with galleries, but started afresh when we opened in Art Central. The concept itself was very interesting, but as they say in real estate it is all about location, location, location. Unfortunately, Art Central never had that. I attended the grand opening of Art Central in conjunction with the grand opening of ArtCity probably in 2005. There was no power to the building except as hooked up to a generator which gave a rawness to the building which was rather edgy. The downside was once the party starting to roll, the music was shut off and we all got kicked out early for whatever reason. Once the building was open in late 2005, I would often visit the First Thursday celebrations with my then new girlfriend. She had never been exposed to cultural activities or galleries before we hooked up and this was a good introduction for her. During the three and a half years we were together I was able to introduce her to other cultural experiences, something I took great pleasure in doing. During this time, I was also running another gallery. When things started rapidly going south at that gallery in March of 2007, I had to look for new space. It was during a time when the overheated commercial real estate market had vacancy rates of less than ½ of 1%. My choices for retail space were extremely limited. For about week I would drop her off at her job downtown, park the car and then go to Art Central to see what the traffic patterns were like in the early morning prior to opening the old gallery in anticipation of signing a lease. The foot traffic was very good as the C-Train station was just outside the door and it was still cool outside, so lots of people passed through. Without getting into the gory details, I moved from a 3000 sq. 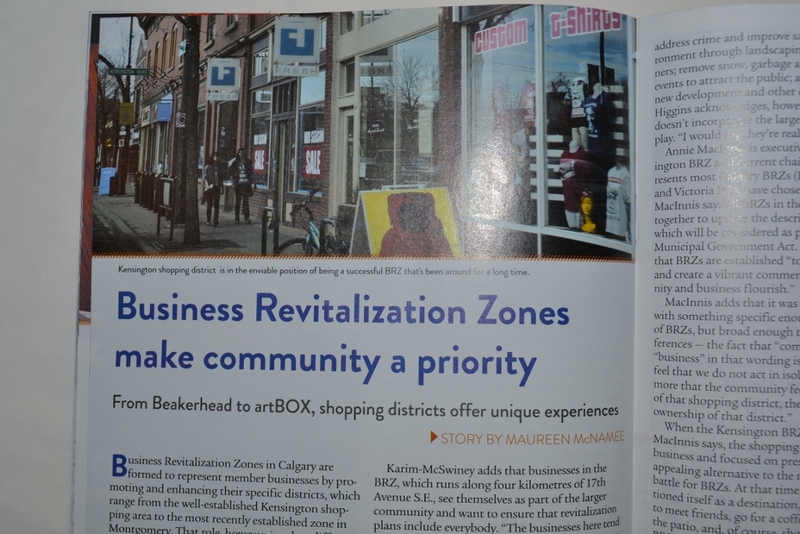 ft. retail storefront space on one of the best streets for art galleries to a 300 sq. ft. space on the +15 level and was open for business two days later. On one of the first days I overheard a short conversation during the afternoon foot traffic rush hour which sadly defined the remainder of my time in that building. Two guys that I assumed were co-workers saw each other on the central stairwell. One said to the other something to the effect of “I’ll race you and see who gets out of the building faster.” Like relationships, sometimes when you start on the wrong foot, it influences everything else to come. I have described my gallery as similar to a corner store on the 401. Sometimes people need a drink or a bag of chips. Most of the time they don’t and zoom right past without a second glance. At first sales were okay. But then the York Hotel came down across the street the next summer and the construction of the Bow Building and the huge underground parking lot with all the dust and noise only affected business even more. The construction of the Bow was the beginning of the slow death of Art Central. I left the building just before the current owners purchased it. All I can say is that I am glad I left when I did. Toward the end, tenant turnover was very high. There were very few occupants in the Art Loop in the basement. First Thursdays were nothing like they used to be and for the last couple years the basement had their lights turned off and the only activity was the music and a few small openings. I am sure that by the time I left, the many accumulated disappointments and unmet expectations during my nearly five years there, only served to acknowledge that this chapter of my life had ended. I look back on my time in Art Central with bittersweet memories. I did some amazing shows there that few noticed and I met top drawer people. When I left, I took the summer off and then started on a new passion – trying to figure out why this city is so weird when it comes to the visual arts. After nearly two decades of running galleries and siting on boards and being actively involved in the community, I don’t believe that I am any closer to figuring out what makes this city tick when it comes to the visual arts. Maybe I never will. Art Central was a great concept that failed to deliver. I am glad that I was part of it. To an old friend. Goodbye. In my former life, I used to sell art. Predominantly it was Canadian art from all periods. 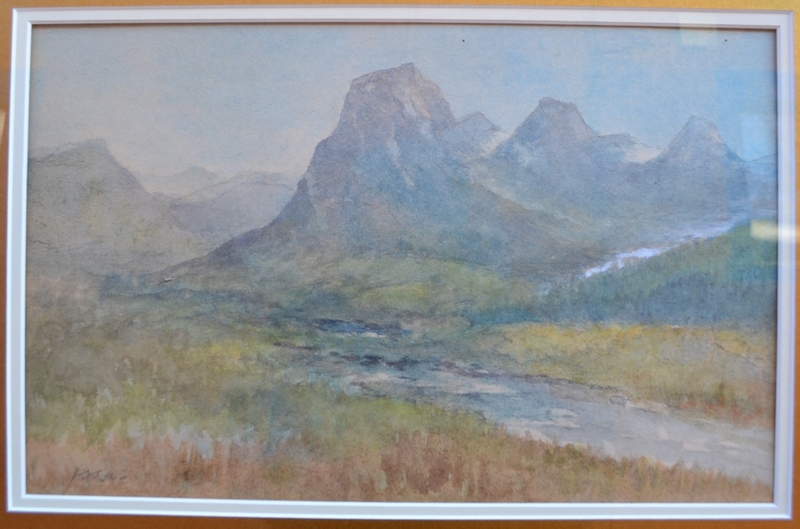 Today I am selling for one of my clients a very nice early watercolour of the Three Sisters near Canmore. It probably dates from around 1910, maybe as late as 1920. 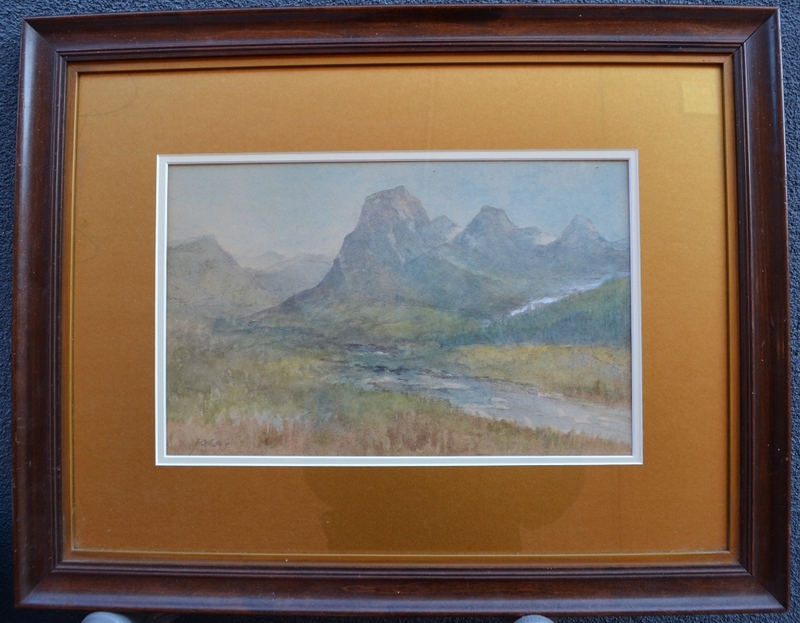 It a modest size, image is approximately 10″ x 15″ (or 25 x 38cm) and from what is visible, it appears to be professionally framed, although I have not taken it apart to confirm. It was painted by an artist called Alfred Arthur (A.A.) Cox, FRIBA [1873-1944]. The initials indicate that he was a Fellow of the Royal Institute of British Architects. According to the label affixed to the back he was living in Vancouver when this was executed. This delicate watercolour is painted in the British landscape tradition of the C.P. Rail artists, with an awareness of more recent art movements from around the turn of the century, such as impressionism. The Glenbow Museum did a show of the C.P. Rail artists’ work and published an award-winning book on them a number of years ago. It is through these artists that our understanding of the Canadian Rocky Mountain landscapes were first brought to a wider audience in the late 1800s, both in Canada and overseas. In my research I could find no written biography of A.A. Cox. So without any further ado here is one that I have prepared. St. Peter’s Anglican, Sherbrooke and many others. In addition to this he designed buildings on campus at Bishop’s University, Lennoxville and the former “finishing school” Dunham Ladies College. He also did a number of bank buildings for the Eastern Townships Bank and the Bank of British North America in various locations around Quebec, and for the same banking institutions and other banks after 1910 in BC. He also designed major alterations and improvements to the office and club of the Canadian Society of Civil Engineering in Montreal. We know with certainty that A. 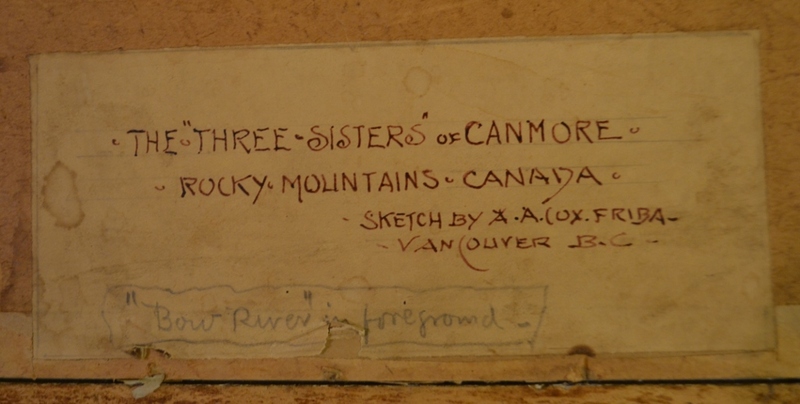 A. Cox was active in Vancouver in the early 1900s and probably had enough work lined up to precipitate his move west. His connections in Montreal served him well when he moved to Vancouver, as he designed the local Canadian Pacific Railway treasurer, William Ferriman Salsbury’s Mission style mansion located at 1790 Angus Drive in Shaughnessey Heights, Vancouver. He also was to design mansions for other prominent individuals such as the Hon. Bowser’s (was this the former BC Attorney-General and later Premier in 1915/1916?) mansion on Rockland Avenue in Victoria. He is listed as the architect of record for the Carter Cotton Building in Vancouver. It was completed in 1908 and is located at 198 West Hastings Street. He also did other office towers and commercial buildings around the same time such as the Canada Life Building. Originally the Carter Cotton Building was used as the offices of the Vancouver Daily News Advertiser which was owned by the extremely interesting Carter Cotton who used this newspaper as a platform to get into politics. This newspaper later was taken over by the Vancouver Province where the building later served as the Province’s offices. As stated previously, he also continued his banking architectural commissions, but expanded his practice to include a number of commissions for the Vancouver General Hospital, the Girl’s Industrial School and the Oakalla Prison at Deer Lake, near Burnaby. He closed out the architectural part of his career in Port Rupert where he designed a movie theatre and the Masonic Temple. Whether he lived out the rest of his life in the lower BC mainland or moved elsewhere for the remainder of his life is unknown at this time. Like many architects, he had an interest in art and/or painting, but like many other architects, probably never made much work as much of his creative thought was used in designing buildings. This work is for sale on behalf of my client. For more information click here.